"Fooled my husband into eating his vegetables. When fully cooked, the texture is like an al dente pasta. You can turn this vegetarian by omitting the ground beef." Heat a large skillet over medium-high heat. Cook and stir beef and black pepper in the hot skillet until browned and crumbly, 5 to 7 minutes; drain and discard grease. Mix tomato sauce, tomatoes, salt, basil, oregano, garlic powder, onion powder, thyme, and red pepper flakes into ground beef; cook and stir until sauce is warmed through, about 2 minutes. Stir tomato paste into sauce. Mix zucchini "noodles" into sauce, pressing down to fully submerge them; simmer over medium-low heat until zucchini is tender, about 10 minutes. 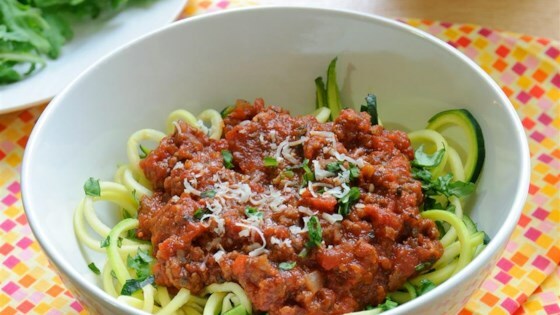 This easy dinner is full of flavor and fewer carbs! For best results of noodle shapes, run the zucchini through a spiralizing tool. Very delicious! The only thing I changed was I used sausage instead if ground beef. I keep everything else the same. Definitely will make it again. This was very tasty, everyone loved it. The only changes I made was I used a lot less salt and Morningstar vegetarian crumbles instead of meat. I also added a bit of cheese on my sons. My pickiest eater went back for 2nds!! I definitely added more Italian spices, garlic etc to the sauce. I used a spicy Mexican style tomato sauce and nixed the red pepper flakes. Much spicier and just as delicious. We made this without meat. We sautéed yellow squash , green bell peppers, carrots, and zucchini and added to our sauce instead of using meat.